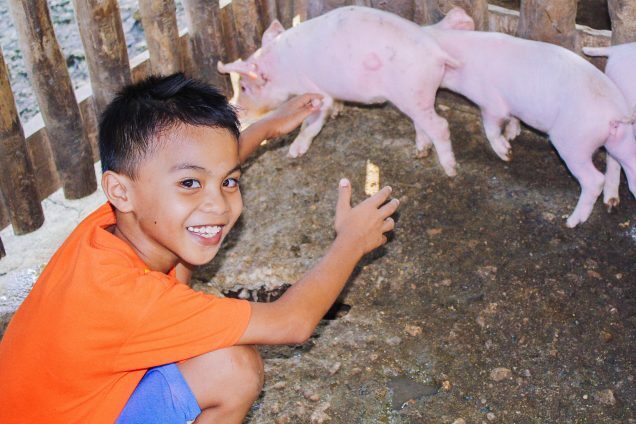 Photo: Our Philippines Director’s son is excited to show the photographer the new piggery. The venture will advance sustainability goals for our local programs. We are happy to report that we have expanded our farmland enterprise in the Philippines to include a piggery, which currently houses 6 pigs. Our native team cares for the pigs by feeding them twice a day, bathing them every morning, and giving them vitamins and antibiotics to protect their health. The piggery was constructed with common materials such as bamboo, irregular wood slabs, coconut lumber, cement flooring, and corrugated roofing sheets. The cost of this makeshift piggery, including the piglets and their starter feed, was fairly low at $723.00. Yield with these 6 pigs will be $1,050 for a net profit of $327 and all starting capital recouped. Soon we’d like to build a new, stronger piggery on the same foundation, which will house 10 pigs and last much longer than the temporary structure. In order to do this we need to buy durable materials such as angle bars, round bars, and galvanized iron pipes. Including the additional pigs and their starter feed, the total cost to improve and expand the piggery will be just $2,114.00. We are thankful for your support and for generous contributions from our donors which will make the improved piggery possible. The micro-venture will be a valuable source of income for us since each healthy, mature pig sells for $175.00 at market. The good yield is attributable to strong demand in the market as pork is a local staple. Thanks to profits from our Philippines farmland enterprise, which also includes a banana grove, a coconut grove, a fishery, and a hen house project, we recently distributed school supplies to 415 impoverished children — they received notebooks, pens, pencils, pencil sharpeners, paper, Crayons, rulers, erasers, folders, and backpacks. These school supplies are items their families could not afford — supplies they must have in order to attend local schools. The children are very happy because now they have the materials they need for their studies. In addition, 30 children received full scholarships this year, providing them with other school needs such as uniforms and shoes in addition to supplies. All of the children are excited to study English, science, math, social studies, and the Filipino language during this school semester. Photo inset: (Top-left) Children from the Payatas Colony in Manila (Top-right): Girls from our orphan home are thankful for a new harvest of bananas. 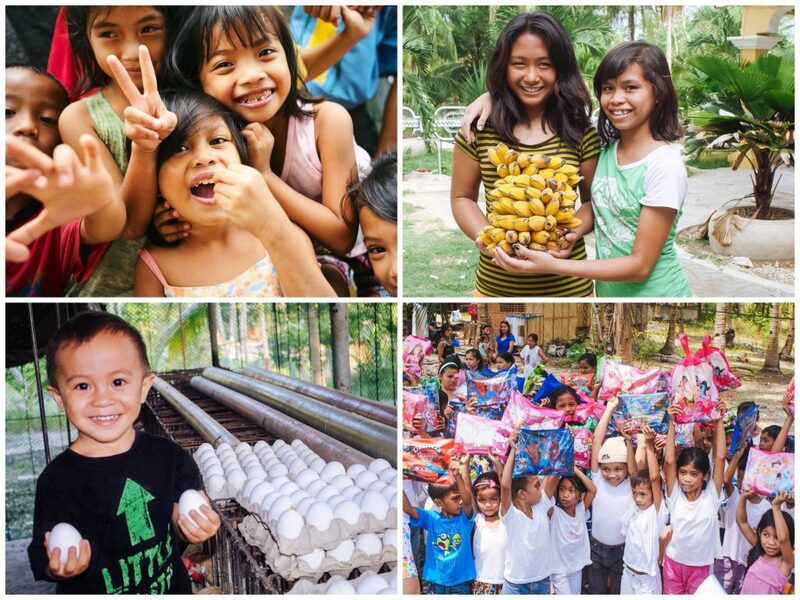 (Bottom-left): This little one is excited for more fresh eggs from our main campus hen house (Bottom-right): Children in an impoverished community are happy to receive all the supplies they’ll need to enroll in school. We are also seeking to construct a permanent building for our Children’s Hope Center, deep in the heart of one of Manila’s most hazardous slums. Situated on the edge of a huge city landfill, the Payatas Colony is a living nightmare where children play in contaminated drainage and are working in unthinkable, hazardous conditions as young as age 5. We’ve acquired a small plot of land in the colony and are ready to build a dedicated space for the Hope Center. Our budget to construct a small building and outfit the space with classroom equipment is $20,000. The program is still in its infancy, right now only functioning a limited number of days as we gain trust in the community and raise more funding. We currently rent a small facility where our program director also runs her small business renting computer time and selling simple to-go meals from her window. The new piggery will help provide ongoing funding for the program, but donations are needed to reach the current capital goals to build our own facilities. Our Manila slum outreach education program is based on our successful model of educational support, tutoring, and nutrition aid we developed in Hyderabad, India. The goal of the model is to support children with everything they need to receive a strong education at an existing local school. By supporting a child to get through school with the nutrition and tutoring support necessary for them to succeed, we’re able to break the cycle of poverty, to rescue them from child labor.